I lifted my my own spirits with a trip to Blithe Spirit on Friday night. 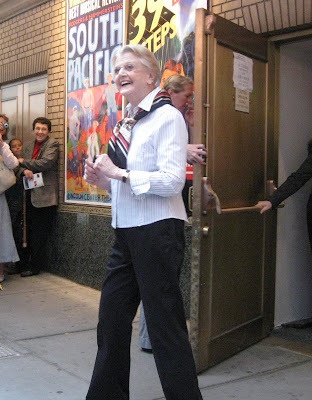 Although I had seen the show several times previously, I had not taken the opportunity to stagedoor. Being a beautiful evening, it felt the right time. Unfortunately, the principals - Angela Lansbury, Christine Ebersole, Rupert Everett, Jayne Atkinson and Simon Jones - didn't materialize. We were only treated to Deborah Rush and Susan Louise O'Connor, who were both lovely. After some errands today, I tried my luck again today only at the stagedoor with windowcard in hand. Although there was still no Christine, Rupert, Helen or Simon today, Miss Lansbury did grant us an audience! And yes, she does look incredible and did say hello and signed my windowcard. Brava! I'm glad your tenacity paid off. Now you'll forget that phone charger more often. Oh yay! What a great picture! She looks so fresh and not her age. Angie! So good! We didn't even try to stage door the other day - we caught the matinee so we figured they'd all be resting. I was there!!!! did you notice a bunch of high school kids together? That was me and my friends from canada on a school trip. such an inspiring stagedoor visit. Do the others often come out, or do they usually just slip out a different door?